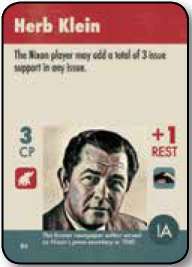 Nixon plays Heartland Of America for 3 CP, which he spends on a Positioning action to give himself two points of issue support in Defense. In addition, he receives one rest cube for this card, which he places in his designated rest cube zone. Then, Kennedy plays Nixon's Pledge as an Event. For the remainder of the turn, he will gain a momentum marker each time Nixon plays a card as any- thing other than a Campaigning action. 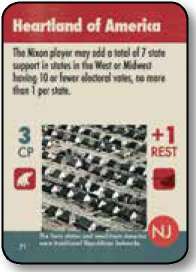 Nixon plays New England for 3 CP, which he spends on a Campaigning action to add three state support cubes in California. He also collects one rest cube. Kennedy chooses to expend one of his momentum markers at this point to trigger the New England Event, allowing him to increase his state support by two in New York, two in Massachusetts (bringing his total support there to 4, meaning he now carries that state), and one in Connecticut. Kennedy then plays the Nixon's Knee Event. 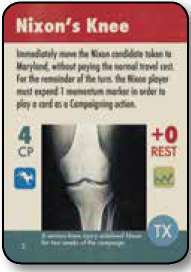 For the remainder of the turn, Nixon will be required to expend a momentum marker in order to play any card as a Campaigning action. This Event also causes Nixon's candidate token to be moved to Maryland. Nixon plays Southern Revolt for 3 CP, which he spends on an Advertising action. His 3 CP entitle him to three support checks, so he draws three cubes from the Political Capital Bag: one red and two blue. Only his own color cubes may be placed, so he decides to put his one media support cube in the Eastern advertising box. He also gains one rest cube. Since he did not perform a Campaigning action, Kennedy gains a momentum marker due to Nixon's Pledge. 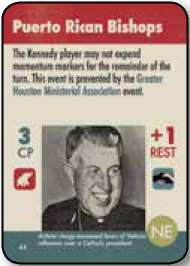 Kennedy now plays Harry F. Byrd for 2 CP and two rest cubes. He opts to Campaign in New York for two additional points of state support; he now carries that state. As this was the only state he Campaigned in, he moves his candidate token to New York. 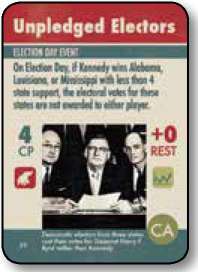 Nixon then chooses to expend a momentum marker to trigger the card's Event, allowing him to subtract two points of state support from Kennedy in Mississippi and one in Alabama. 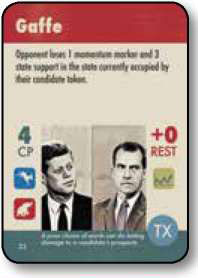 Nixon plays Gaffe as an Event, causing Kennedy to lose a momentum marker as well as three state support in New York (where his candidate token is located). With only one remaining sup- port there, he no longer carries that state (although he is still leading it). Nixon's decision not to perform a Campaigning action, however, gives Kennedy a momentum marker due to Nixon's Pledge. Kennedy plays Gathering Momentum In The West for 4 CP, which he spends on Campaigning to add three state support in New York (which he now carries again) and one in Pennsylvania. Once he is done, Nixon doesn't hesitate to trigger this Event, since he is currently leading more states in the West than Kennedy. He will therefore gain a momentum marker to offset the one he spent to trigger it plus one point of state support in every empty state in the West. Nixon plays Harvard Brain Trust for 4 CP, which he spends on a Campaigning action (first expending a momentum marker due to Nixon's Knee) to add two state support each to New York and Pennsylvania. As New York is currently being carried by Kennedy, he would ordinarily be required to make a support check for each point spent there, but Nixon's media support in the East exempts him from this requirement and he simply reduces Kennedy's support there by two points. 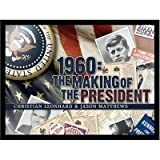 Similarly, while he would ordinarily be forced to make support checks in Pennsylvania due to Kennedy's presence there (despite the fact that he is not actually carrying the state), he may simply apply two points of state support there thanks to his earlier advertising in the region. These two points allow him to remove Kennedy's single support cube in the state and place one of his own, stealing the lead in that state. He has the option of moving his candidate marker to either of the states in which he Campaigned (since he has not left the region), so he chooses to move to Pennsylvania. Once Nixon is done, Kennedy spends a momentum marker to trigger the Event on his card and places the Harvard Brain Trust card on the board in the space reserved for persistent Debate Events. This card will give him a bonus when resolving issues during the Debates on Turn 6. Kennedy then plays Puerto Rican Bishops for 3 CP, which he spends on Positioning to add one issue support each in all three issues, reducing Nixon to one cube in Defense and taking the lead himself in both Economy and Civil Rights. He also collects one rest cube. 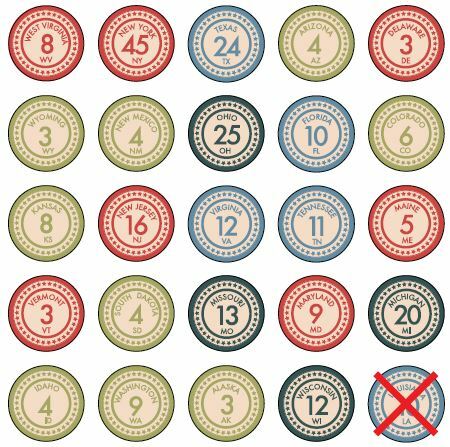 At the start of the Momentum Phase, both players must discard half of their unused momentum markers. This loss is rounded down, however, so Kennedy gets to keep his one remaining momentum marker, while Nixon has none to lose. Next, Nixon has the opportunity to shift an issue on the Issue Track since he has more media support cubes on the board than his opponent (one cube in the East to Kennedy's none). He's happy with Defense where it is in the top spot, but decides to boost Civil Rights and move that issue up to the second place position in the Issue Track, bumping Economy down to third place. The players then receive awards for their issue support. Kennedy's lead in Economy wins him one momentum marker, while his lead in Civil Rights gives him the choice of another momentum or an endorsement. 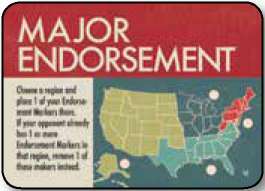 He chooses to draw an endorsement card and receives an Endorsement In The South, allowing him to place an endorsement marker in that region's advertising box. Nixon has the lead in Defense, which is the top issue in the Issue Track, so he gains both a momentum marker and an endorsement. 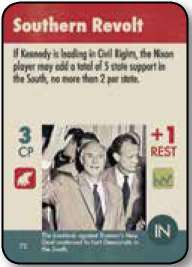 Drawing a card from the endorsement deck, he receives a Major Endorsement that allows him to place an endorsement marker in any region he chooses; he picks the South, removing Kennedy's endorsement there. After resolving these awards, one issue support cube is removed from each issue on the Issue Track. As neither player had more than one support in any issue, no support now remains for either candidate in any issue. Both players place their sole remaining card facedown on their respective Campaign Strategy Stacks. Finally, both players place their accumulated rest cubes in the Political Capital Bag. Turn 1 is now complete! The first two cubes drawn for the Initiative Check are both blue, so no third draw is necessary: Kennedy wins the initiative. 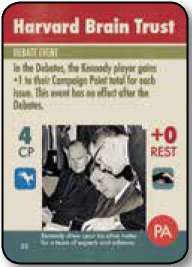 Both players retrieve the cards from their Campaign Strategy Stacks on the board and move the issue tiles from the Issues Track to the corresponding spaces on the debate board, from lowest to high- est position: in this case, Economy, Civil Rights, and Defense. Nixon selects his Opposition Research card while Kennedy selects Give Me a Week and both players reveal their selected cards. 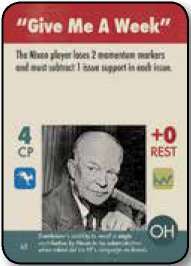 Nixon's card is played to the Defense issue and is placed to his own side of that issue. 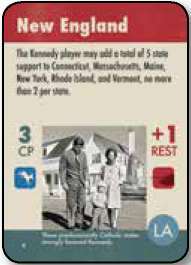 Kennedy's card is played to Economy on his own side. 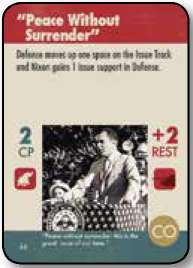 Kennedy decides to play his "Peace Without Surrender" card this time, a Defense card which features only his opponent's candidate icon, meaning it will be placed to Nixon's side. 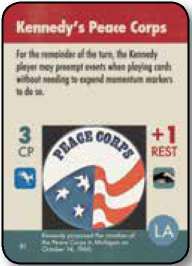 This is Kennedy's only Defense card, however, so (knowing he cannot win that issue) he chooses to force that issue to resolve early, increasing the rewards for the other issues which he still hopes to win. 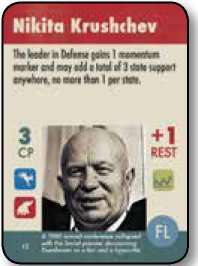 Similarly, Nixon selects Nikita Kruschev, an Economy card. 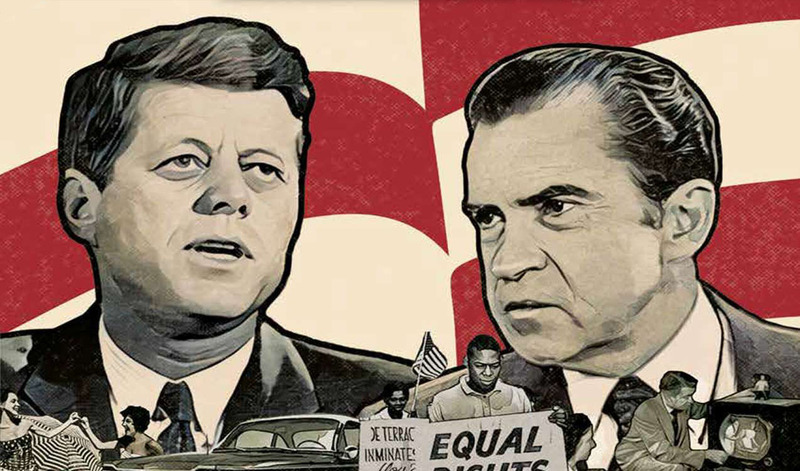 While this card features icons for both candidates (mean- ing he can place it to either side), he too knows he cannot win this issue and chooses to place it to his opponent's side using similar thinking to Kennedy's. 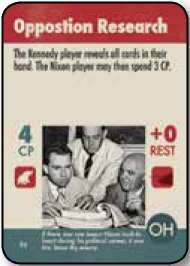 Nixon now has two cards on his side of the Defense issue, while Kennedy has two cards on his side of Economy. Both of these issues have been won, but Economy (being in a lower position) is resolved first. Nixon has no cards on his own side of this issue, so Kennedy wins it by default, earning two state support cubes to place anywhere he likes. He uses both in California to reduce Nixon's support there from three cubes down to one. The Economy issue tile is then returned to the Issues Track, in the lowest position. 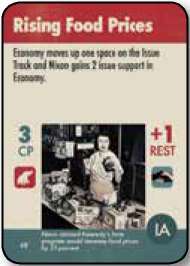 The cards played to the Economy issue are discarded. 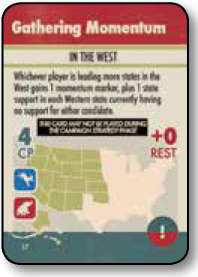 The Defense issue is now resolved, giving Nixon (the only player with cards next to that issue) three state support. He places one in Indiana to give him his fourth cube there, allowing him to carry the state, and puts the remainder in California to rebuild his support to three there. The Defense issue tile is then returned to the middle position in the Issues Track. The cards played to the Defense issue are discarded as well. Nixon selects Herb Klein; Kennedy selects Kennedy's Peace Corps. Both cards are played to Civil Rights and placed on the players' own sides. Nixon selects Rising Food Prices; Kennedy selects Profiles in Courage. Again, both cards are played to Civil Rights, on the players' own sides. 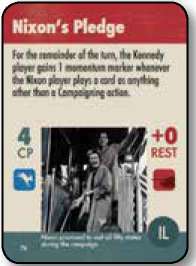 This closes out the issue, with 5 CP played to Kennedy's side and 6 CP to Nixon's side-an apparent win for Nixon. 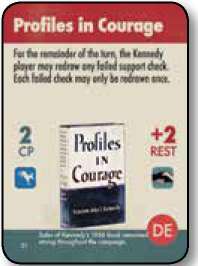 However, the Harvard Brain Trust persistent Debate Event is in effect, (having been played on turn 1), which gives Kennedy +1 to his total in each issue during the Debates. This brings his total up to 6 CP, creating a tie in Civil Rights. In the case of a tie, the issue goes to the player who won the initiative, so Kennedy wins the final issue and gets to place four state support cubes. He places all four in California, removing Nixon's three support there and placing one cube of his own. The Civil Rights issue tile is then returned to the Issues Track, in the highest position. The cards played to the Civil Rights issue are discarded. With all three issues having been resolved, the Debates are now over. The players' remaining unplayed cards are discarded, and the game resumes with Turn 7. Nixon has two media support cubes in the East to Kennedy's two in the Midwest and one in the South. Nixon therefore places two cubes from his supply into the Political Capital Bag, while Kennedy adds three of his own. Both players then remove all their media support cubes from the regional advertising boxes as well as their issue support cubes from the issue tiles and place them in the Political Capital Bag as well. In addition, Kennedy turns in his one remaining momentum marker for two additional cubes to be placed in the bag while Nixon, with two momentum markers left, adds four cubes of his own. Next, an Initiative Check is made: the first two draws are one blue and one red, so a third (red) cube is drawn, giving the initiative to Nixon. Both players then retrieve the cards from their Campaign Strategy Stacks on the board and make three support checks for each. The player with the initiative gets to go first. 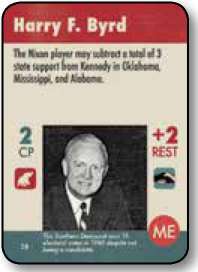 Nixon, with the initiative, draws three cubes each for the states identified on his cards: Minnesota, North Carolina, Connecticut, and Florida. He draws three red cubes for Minnesota, removing Kennedy's two support in that state and gaining one of his own. In North Carolina, he draws one red and two blue; this gains him only one support, which is enough to remove Kennedy's single cube there but not enough to add one for himself. Nixon draws two red and one blue for Connecticut, where he already has the lead with one cube, so he increases his support there by two. 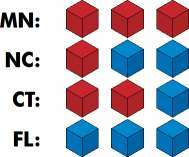 Lastly, in Florida, he draws three blue cubes, failing to win any support in that state. Kennedy now draws for his own cards: Wisconsin, Ohio, and two cards for New York. His draw of three red cubes for Wisconsin gains him nothing there, but he draws three blue cubes in Ohio for a gain of three state support, enough to eliminate Nixon's three support cubes there. Kennedy then draws six cubes for New York (since he had two New York cards set aside), drawing four blue and two red. Four state support is enough to remove Nixon's three cubes in New York and give him one there of his own. 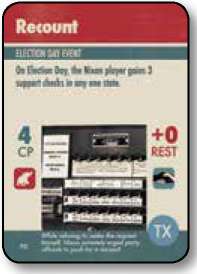 After resolving both players' Campaign Strategy cards, any persistent Election Day Events are resolved. In this case, Nixon gets to resolve the Recount Event, which grants him three support checks in a state of his choice. 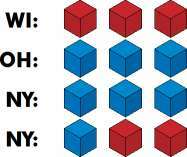 He selects Ohio, but draws three blue cubes and fails to add any support there. At this point, any states which are currently empty of support for either player are tipped to the player having an endorsement in that region, or-where neither player has an endorsement-the built-in edge in that state. Kennedy places one cube in Ohio thanks to his two endorsement markers in the Midwest; Nixon, with an endorsement of his own in the South, gains support in both North Carolina and Georgia. Neither player has any endorsements in the East, so the empty New Hampshire with its edge for Nixon goes to him, while Kennedy takes West Virginia. There are no empty states in the West. 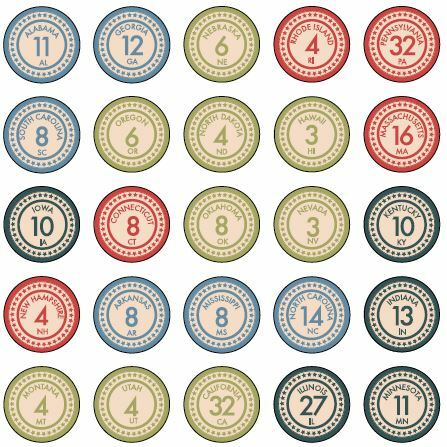 Finally, both players claim the state seals for every state where they have support and add up their total electoral votes. However, the Unpledged Electors Election Day Event happens to be in effect, so Kennedy may not claim Louisiana, where he only has three support (less than the four required by this Event); neither player receives this state's votes.